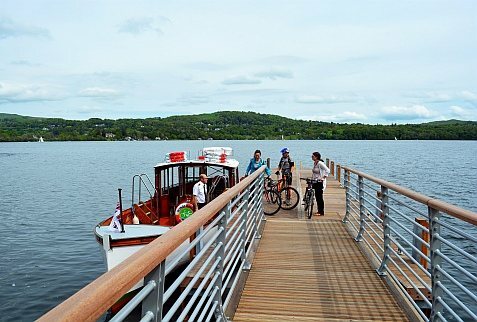 Run by Windermere Lake Cruises, the specially adapted traditional vessel – known as Sunflower – can carry up to 12 bikes and will be running 8 times per day from next Saturday 23 July until Sunday 4 September 2016. The Bike Boat service links Brockhole, The Lake District Visitor Centre, with Windermere’s tranquil western shore. A second stop off point at Bark Barn jetty near Belle Grange creates a convenient circular route that all ages and abilities can access. Although foot passengers are welcome on board the Bike Boat, special priority will be given to cyclists crossing England’s longest lake to enjoy the flat, mostly traffic-free route along the lakeshore. From here, there is easy two-wheeled access to Wray Castle, the ancient woods of Claife Heights and the quiet roads up to Beatrix Potter’s Hill Top.